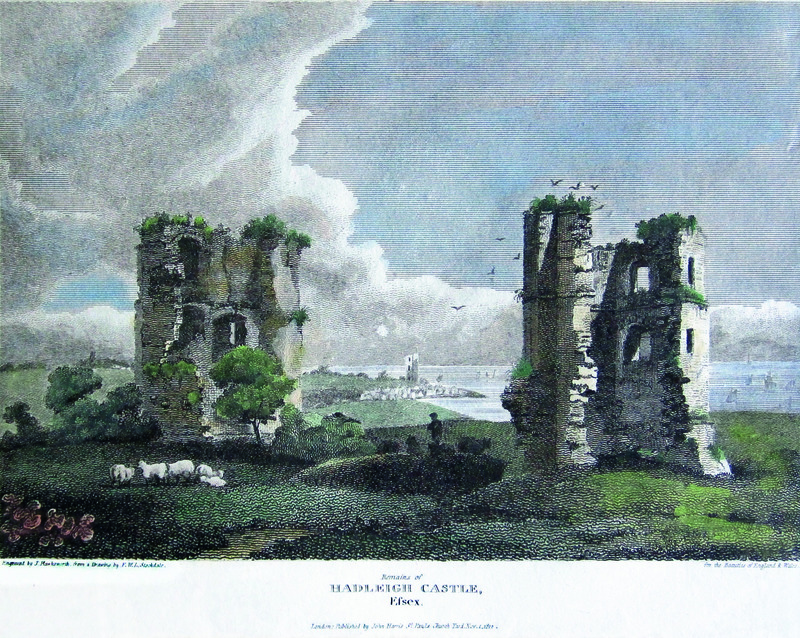 When Rebecca Harris became Castle Point MP, a friend of hers spotted a framed, hand-coloured engraving, of Hadleigh Castle in Portobello Road Market, London, and thought she might like it. 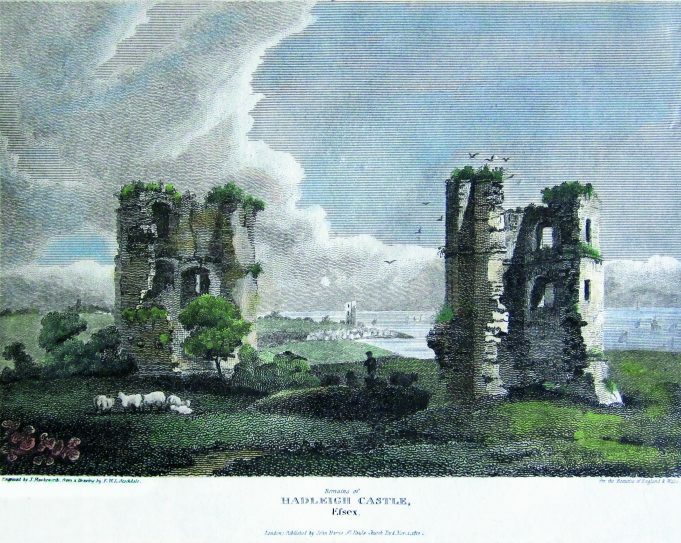 The hand-coloured engraving was from a folio called: The Beauties of England and Wales, published by John Harris, St Paul’s Churchyard, Nov 1st 1812. Engraved by J. Hawksworth from a drawing by F. W. I. Stockdale. This type of print was very popular in its day and many thousands were produced for the mass market. They are nevertheless quite collectable, but there is no need to “itemise them” on the Household Insurance! The picture is quite interesting insofar as the main (South East) tower looks pretty much as it is today. The North East tower is far less decrepit, but is this authentic or merely “artistic licence”? I’m pretty sure Stockdale never visited Hadleigh to make his drawing and relied on second-hand references. In the Stockdale drawing, Leigh Church (St Clements) is clearly shown in about the right place, but considerably over-scaled. St Mary’s, Prittlewell can also be seen which, although an extraordinary notion in modern times, was not beyond the realms of possibility as (sadly) the scar of Southend University’s white dome can now (in 2012) be seen all too clearly from the Castle grounds on a fine day. Any idea what the strange red shapes are supposed to represent in the bottom left corner? There is a similar print for sale at the following reference and the strange shapes are not red in this one, so perhaps a quirk of the hand colourist? Many thanks to Rebecca Harris for sharing her picture with us.